Divided Tote With Records Pocket, manufactured by Hopkins Medical Products, is the cost-effective choice for traveling medical professionals. This medical equipment bag is especially ideal for professionals that need a dependable option that is HIPAA compliant. 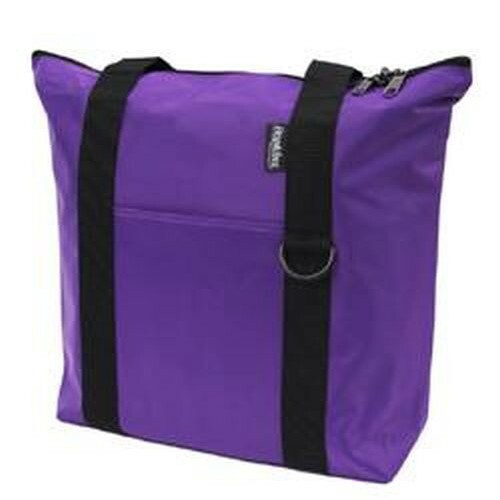 Featuring three internal divided pockets and several smaller outside pockets, this nursing bag is spacious enough to securely contain patient records, diagnostic equipment, and medical supplies. To further enhance this bag's functionality, it integrates several smaller pockets on the outside, ideal for cell phones, pagers, hand sanitizer, or keys, other small important objects to which you might need quick access. The Divided Tote With Records Pocket is also available in six vibrant, fashionable colors that will complement your aesthetic flair. The bag is also reinforced at the bottom with stiffener, ensuring a durability and dependability. Order now and enhance your traveling practice today! Outer pockets for a cell phone or pager. Patient record compartment with a lockable zipper. Product Numbers: 537891BRGNDY, 537891HNTRGRN, 537891NVY, 537891PRPL, 537891RYLBL, 537891TL, 537893BRGNDY, 537893HNTRGRN, 537893NVY, 537893PRPL, 537893RYLBL, and 537893TL. Colors: Burgundy, hunter green, navy, purple, royal blue and teal. Medical Tote Length: 14 inches. Medical Tote Depth: 4 inches. Medical Tote Height: 14-1/2 inches. The bag is exactly what I expected in terms of color and size. It only comes with one lock, even though there are two sets of zippers that could be locked. Also, the lock is very dinky and seems like it could easily break.